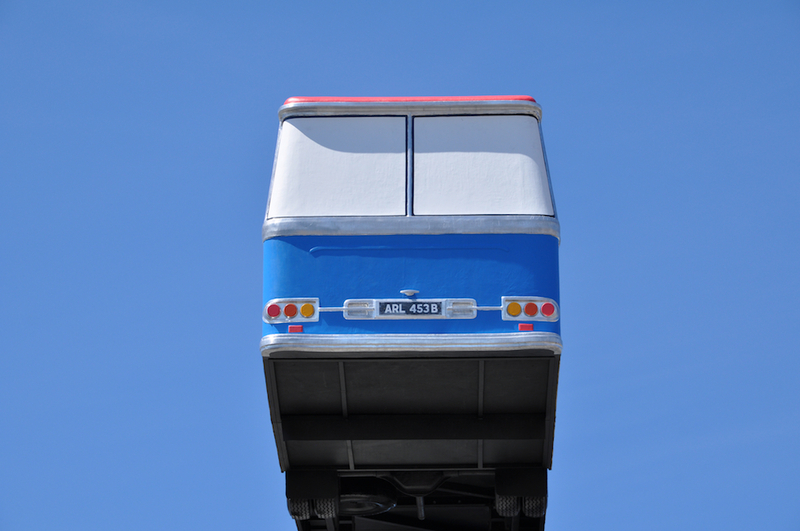 As a starting point for sculpture, the last line of The Italian Job might not seem like an obvious, sensible or even remotely workable choice but then Richard Wilson isn’t an artist to let a little thing like impracticality get in the way of a good idea. 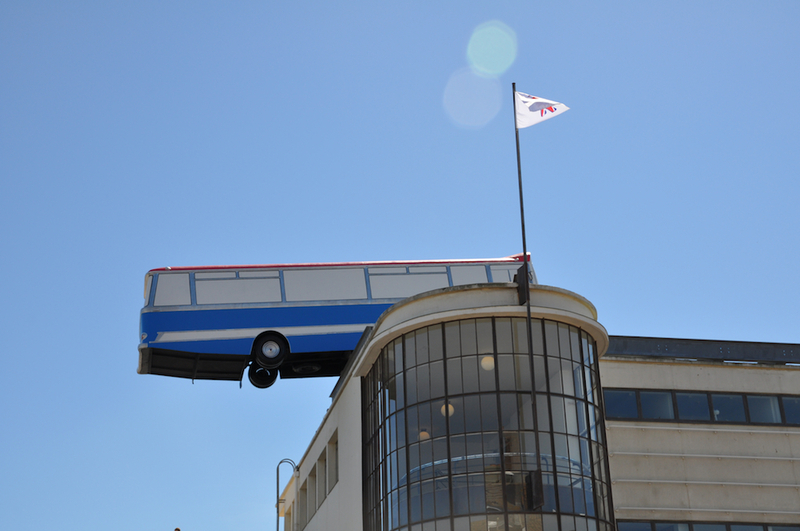 So, how better to join in the flag-waving of this summer than by balancing a replica of a red, white and blue coach over the edge of the roof of an iconic seaside building? Having written about this summer’s bus-based art a while ago for MostlyFilm, I hadn’t intended to post about this here but a spate of transport related posts have brought it back to mind and you can never have too much sunny, smile-inducing art. Well, you probably can, but let’s plough on regardless. I think for me the thing I like most about Hang on a minute lads, I’ve got a great idea… is the preposterousness of the idea. The work is, in the end, a simple idea that draws on a line from a film, familiar to most of us, and almost without pause for thought pulls it into three dimensions. There’s an audacity to the project that really appeals. Clearly, the bus isn’t actually balanced there on the edge at the mercy of the wind, indeed the girders that keep it in place are visible, but somehow this doesn’t take away from the work. Standing in the car park the coach looms over us looking slightly cartoon-like against the sky. When seen from the side the picture is clearer and the movement of the coach becomes mesmerising. This is art that does what it sets out to do and in the process it gives us space to marvel at its own absurdity. The Italian Job isn’t the first film that would spring to mind as being believable so Wilson didn’t exactly need to keep it real. This is a exactly the sort of playful diversion the seaside is all about. This entry was posted in Film/Video, Installation, Sculpture and tagged art, flag, Hang on a minute lads I've got a great idea..., installation, Richard Wilson, sculpture by Ann Jones. Bookmark the permalink.